Previously filed the stately lawns of the castle Augustenburg right up to the banks of the old raft trench. Their adjoining the village was part of the yard for a long time as a paddock. After a donation of the young Marquis William, the second son of Grand Duke Karl Frederick and Louise Caroline of Hochberg's, the area was built in 1806 by the municipality. 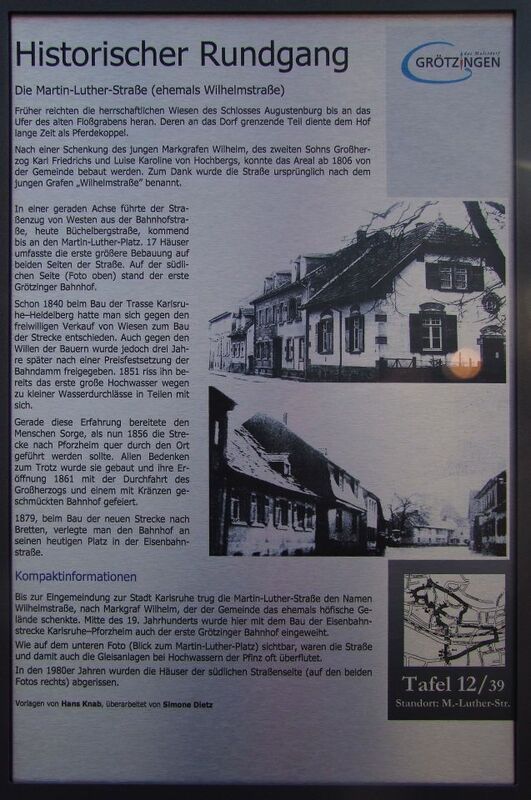 In gratitude, the street was originally named after the young Count "Wilhelmstrasse". In a straight axis led the stretch of road from the west of the Bahnhofstrasse, today Büchelberg road, coming up at the Martin-Luther-Platz. 17 houses included the first major development on both sides of the road. On the southern side (photo above) was the first Grötzinger station. Already in 1840 the construction of the route Karlsruhe-Heidelberg had decided against the voluntary sale of meadows to build the line. Even against the will of the farmers but was released after a price-fixing of the embankment three years later. 1851 tore it already the first major flood due to small water passages in parts with it. It is this experience prepared people worry, as now in 1856 the route Pforzheim should be performed across the site. Despite all the misgivings she was built and opened in 1861 celebrated the passage of the Grand Duke and a decorated with wreaths station. 1879, the construction of the new route to Bretten, moved to the station to its current place in the Eisenbahnstraße.